You might have lived a situation like the one below when speaking Portuguese. You are leaving the restaurant when you bump into your Brazilian friend. She asks: “Do you come here often?” You want to say that you eat there once in a while, but you are not sure how to say that in Portuguese. Your brain then turns to your native language, and you try to translate the expression to Portuguese. This method, however, frequently fails because the literal translation often isn’t the correct way to say it. Today’s video lesson will be short and easy: I will show you how to say Once in a while in Portuguese, so you don’t find yourself in the situation above. Janete: Você vem sempre a esse restaurante? Diogo: Só de vez em quando porque não é muito perto da minha casa. Janete: Do you come frequently to this restaurant? Diogo: Only once in a while because it’s not very close to my place. Janete: Como você mantém contato com sua rede de relacionamentos? Diogo: De vez em quando eu envio uma mensagem rápida para as pessoas com quem não tenho contato frequente. Janete: How do you keep in touch with your network? Diogo: Once in a while I send a quick message to the people with whom I don’t have frequent contact. I hope this helps you communicate better in Portuguese. Learning one expression at a time is a powerful, stress-free way to increase your vocabulary in Portuguese so you can use the right expression at the right time to communicate with confidence. 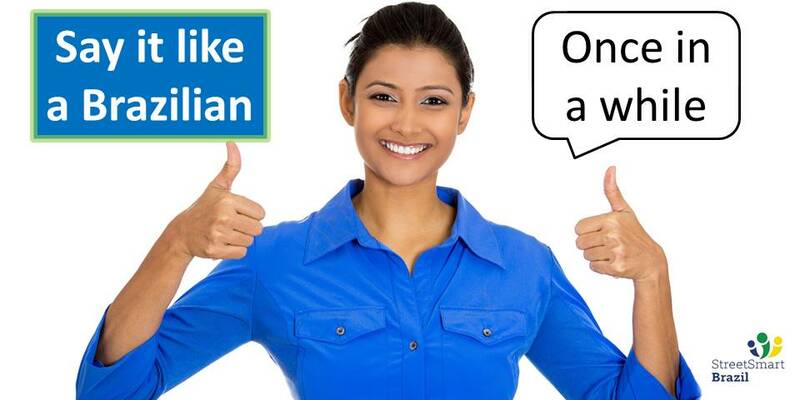 To advance your Portuguese and gain confidence much faster, book lessons with one of our professional instructors. Start by booking a Trial Lesson here. Hi Luciana! I’m from California – Fairfield! You probably know it:) Feeling really happy to have landed on your site; I’m moving to Sao Paulo in about two weeks to launch my own site to find language partners to meet up with in person (Chatterplot) and I need to learn Portuguese asap. Thank you for taking the time to make these videos – pronunciation is what’s killing me! Oi, Shana! How exciting that you will move to Brazil to launch your own site! I love São Paulo! I hope you will like it too. I very much encourage you to consider taking Portuguese lessons or finding a great practice partner. Moving to a new country is challenging even when we speak the language. 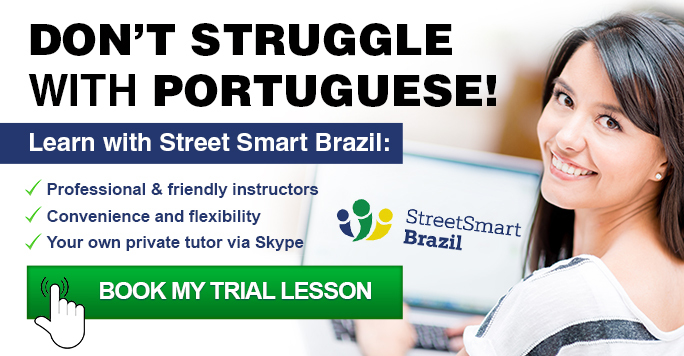 You might have seen on the website that we offer Portuguese lessons via Skype. If you’d like to try it, we offer a 30-minute Trial Lesson, so you can see how it works for you. In fact, many of our clients live and work in Brazil, and take lessons via Skype with us.